Always Call Before You Wire! In recent news, the number of wire fraud scams reported by title companies to the Internet Crime Complaint Center spiked 480 percent in 2016 according to a warning that was recently issued by the Federal Bureau of Investigation. While our team at Fidelity National Title has extensive security measures in place to minimize risk and protect our clients, we are aware that fraudsters are constantly seeking creative ways to scam innocent victims. REALTORS®, real estate brokers, buyers and sellers are targets for wire fraud and many have lost hundreds of thousands of dollars because they simply relied on the wire instructions received via email. 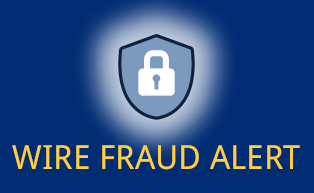 A fraudster will break into a licensee’s email account to obtain information about upcoming real estate transactions. After monitoring the account to determine the likely timing of a close, the hacker will send an email to the buyer, posing either as the escrow agent or as the licensee. The fraudulent email will contain new wiring instructions or routing information, and will request that the buyer send funds accordingly. STEP 2: Call the phone number you wrote down from step#1 above to speak directly with your Fidelity National Title escrow officer to confirm wire instructions PRIOR to wiring. If you receive alternative wiring instructions appearing to be from Fidelity National Title, be suspicious as we rarely change our wiring instructions.